Sweden is the leading exponent of panelised building systems, with around 80 per cent of its housing incorporating elements prefabricated in factories to reap the construction time, quality and labour efficiency advantages. Adopting automation for the manufacture of housing panels in Sweden dates back 50 years. Not surprisingly, then, Sweden is also home to Randek – a leading manufacturer of the automation equipment used in these factories. Weather has been a significant influence in the development of the panelised building industry. Even when the weather is conducive to onsite works (southern Sweden in late spring was colder than the corresponding late autumn weather in Melbourne) it really slows things down. In the cold, concrete slabs can take three weeks to dry sufficiently to permit subsequent works. As a result, the speed to get to lock up and allow internal fit-out is paramount. With extensive use of timber elements, keeping the site weatherproof and weather-attuned scheduling of deliveries for installation are key. In addition, harsh winters mean that groundworks are extensive – crushed rock below floor slab and surrounding the home is required to avert problems from freezing in Winter. The motto of one of Sweden’s vertically integrated businesses – the Derome Group – is “from forest to finished house.” The evolved nature of such businesses and the Swedish prefabricated industry in general is quite different to the situation confronting Australian firms embarking on panellised construction and how they best interact with the other industry players. Sweden harvests less than the forest growth each year, so its wood supply continues to increase! Timber holds a special place in the Swedish psyche and policy framework. The drive to continue to value add to the timber harvested from the forests is longstanding and ingrained. This can also show up in the market for projects where, for example, a council can designate a new area within the forest to be cleared for a new housing estate, and specify that the new homes will be made from wood. While this may reflect what the home purchasers want and expect, it does preclude the more nuanced consideration of alternative materials and methodologies that we would expect to apply in the Australian context. While it has been only in recent years that the automation of panel manufacture for housing and other buildings has attracted much attention in Australia, a number of players like Strongbuild, Impresa House, CSR Velocity and FutureFit have already installed and are utilising this kind of technology, and there are others who are looking to do so. Importantly, it is not just the advances in the physical equipment that characterises the impressive capabilities of the latest incarnations of this machinery. These days it is the embedded software and data file handling capabilities that really boosts the throughput potential of the automated production lines. 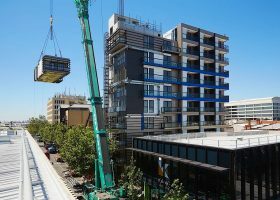 Does Offsite Construction Threaten Builder Margins?